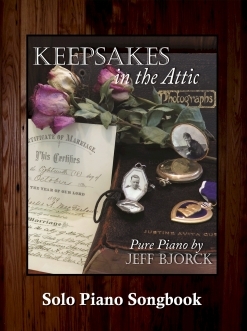 Keepsakes in the Attic is the companion sheet music ebook to Jeff Bjorck’s 2016 solo piano album by the same name. 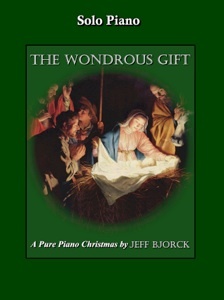 The thirteen pieces from the album are available as individual downloads or the complete album can be downloaded as an ebook from Jeff’s website (purepiano.com). None of the pieces in this collection is overly difficult, and pianists at an upper-intermediate to early-advanced playing level (and above) should have no problems mastering this music. The music was transcribed note-for-note by John Zechiel and proofed by me (Kathy Parsons) to ensure that the sheet music is as close to the recorded music as possible. The transcriptions include metronome settings, suggested pedaling, dynamics, and expression. The notation is well layed-out, spacious and easy to read. True to the theme of the album, most of the pieces are somewhat to very nostalgic and have an “old-timey” feeling to them. Some are very sentimental, some are quite classical, and some are lighter and more upbeat. 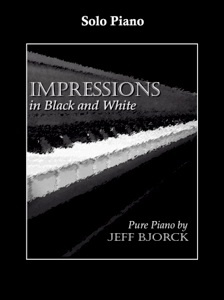 Playing through the whole book makes for a very pleasant session at the piano, as there is a variety of moods and events expressed. My favorite in the collection is “Hearts Far Apart,” one of Bjorck’s most beautiful compositions. 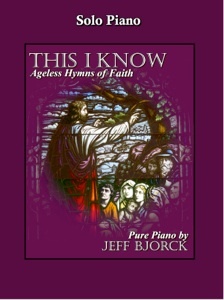 This excellent collection is available from www.purepiano.com. Recommended!